easy and delicious kesar pista malai kulfi recipe made without condensed milk or khoya (mawa). firstly take 1 litre full fat milk in a large and heavy sauce pan or pan or kadai. on a low flame or low heat, bring the milk to a boil. do stir when the milk gets heated up, so that it does not burn from the bottom. stir once the milk comes to a boil and add the malai (clotted cream) back to the milk. continue to cook milk on low flame till it reduces to ⅓ of its original volume. keep on stirring and remove the clotted cream (malai) which forms on top of the milk and add it back to the milk. also keep on scraping the dried milk solids from the sides and add them back to the milk. this way stirring often, reduce the milk to ⅓ of its original volume. keep the flame to a low and add ⅓ cup sugar. then add ¼ teaspoon cardamom powder. next add a pinch of saffron strands. then add 2 tablespoons chopped almonds or sliced almonds. then add 2 to 3 tablespoons chopped pistachios or sliced pistachios. then add 2 tablespoons chopped cashews. add ½ cup cream. you can use low fat (25% to 35% fat) cream. mix the cream very well with the rabri mixture. on a low heat or low flame, just gently bring to one boil. when the kulfi mixture comes to a boil, then switch off the stove. add 2 teaspoon rose water or kewra water. mix very well. cover and let the mixture cool at room temperature. once done, pour the malai kulfi mixture in kulfi moulds or popsicle moulds or kulhads or matka. cover tightly with lids or aluminium foil. 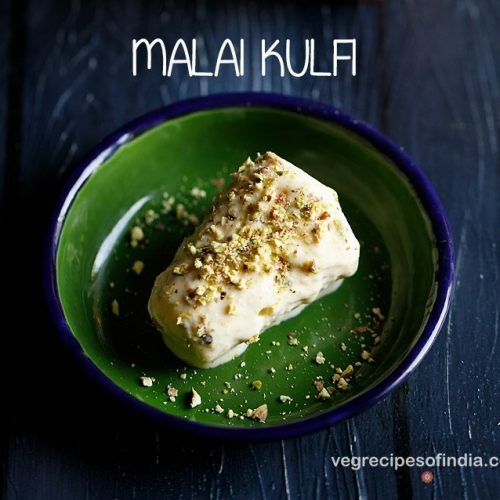 freeze malai kulfi for 7 to 8 hours or overnight. before serving malai kulfi, take the kulfi mould and just warm it by moving it between your palms. with the back of a spoon, slid through the sides. if used a kulhad or matka, then directly have the malai kufli from it. place the malai kulfi on a serving plate or tray. sprinkle some finely chopped pistachios or almonds on top. addition of finely chopped pistachios or almonds is optional and you can skip this step. malai kulfi recipe can be doubled or tripled. some milk powder or khoya or mawa can also be added. low fat cream as well as heavy whipping cream can be used. do make sure that the milk does not get burnt. so simmer on a low flame and stir often. also use a heavy bottomed pan or kadai to make matka kulfi. rose water or kewra water can be skipped if you do not have them. use full fat milk to get the best results.